Looking forward to the publication of this first translation of Ernst Jünger's Der Waldgang from Telos Press in December! Until then the cover image also provides food for thought. Visually, I find it original and eye-catching. More importantly, it communicates in a nicely condensed form much of what Jünger has to say in the text; any reader ripe for the author's message should understand to pick it off the bookshelf. 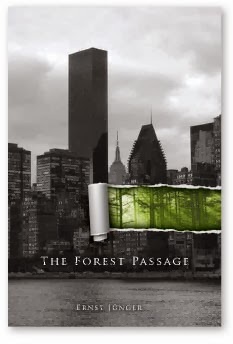 The image makes it clear that a forest passage is not an historic Icelandic phenomenon (the origin of the term), but rather a live-saving possibility in the concrete jungle too. It suggests that the grey facade of technological civilization can be torn aside by a resolute individual, and that behind it will he will find an eternally intact wilderness, a forest of primal freedom, and of dangers that are worth the risk. When his hunger for a personal destiny, his hatred of being a number, a statistic in the machine of Leviathan is strong enough, or when he is simply driven to the adventure by desperate circumstances, he will discover that the apparent omnipotence of society and state is only an intimidating bluff, a veneer that avails itself of showy technology. He will discover that a lone brave heart can stand up to this Goliath too. The tear that he makes in the fabric of society, openly or secretly, lets new light shine into his world, light from an infinitely greater and older source than the artificial power "illuminating" and impelling modern civilization on its brief, fiery trajectory. This light reveals to him for the first time the possibility of his own true path, of a destiny that he was uniquely born to fulfill, of which the state and even Google can know nothing at all.